If you’ve never watched Black Mirror, you absolutely should. Sure, it’ll probably leave you incredibly paranoid of all of the technology around you and the negative implications it could have on your life, but that’s all part of the fun. Following the release of Black Mirror’s fourth season towards the end of last year, some fans might be eagerly anticipating Charlie Brooker and Annabel Jones’ next batch of mind-bending episodes. Well, here’s what we know of a Black Mirror Season 5 release date. Let’s get the elephant in the room out of the way right now. At the time of writing this post, there’s no official word on an exact Black Mirror Season 5 release date. Neither Netflix, nor the show’s creators have announced anything publicly as of yet. However, there may have been a slight slip-up over at Netflix HQ just a day or two ago that may have not only confirmed the name of the first episode, but its release date on the streaming service, too. 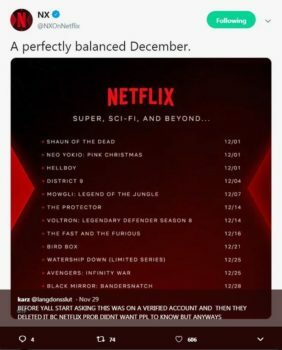 Reported first ironically by The Mirror, a Twitter user claims to have spotted a tweet from an official Netflix account revealing that the Black Mirror Season 5 release date is Dec. 28. The first episode’s title, Bandersnatch was also revealed. We’ve included the alleged tweet down below. What gives this such credibility, however, is the fact that all of the release dates prior to Black Mirror’s Dec. 28 release date are correct. Perhaps Bandersnatch’s release date wasn’t yet supposed to be revealed and that’s what resulted in the tweet having now been deleted. For now, it’s just going to be a case of waiting to see if Dec. 28 is officially announced as the Black Mirror Season 5 release date, or if it even happens to drop sooner. Further, there’re still questions surrounding whether or not Dec. 28 will only see the first episode of Black Mirror Season 5 released, or the full season. We’ll be sure to update this post as and when we find out more. For more on Black Mirror, TV and everything video games, be sure to search for Twinfinite.